I came back from a volunteer trip to Addis Ababa, the capital city of Ethiopia, about six weeks ago. It’s going to take a long time for me to weave everything that I saw and heard and did into our life here in Cambridge, but I can’t wait that long before I share some (mostly) good news with you, and ask you for your help. Bad news first: only about 45 percent of children in Ethiopia attend primary school. Government-run public schools, which have an average student:teacher ratio of 59:1, are not an option for most because families cannot afford to pay the required fees for uniforms, books, paper and pencils. Only about 36 percent of adults are literate. But I promised you good news! 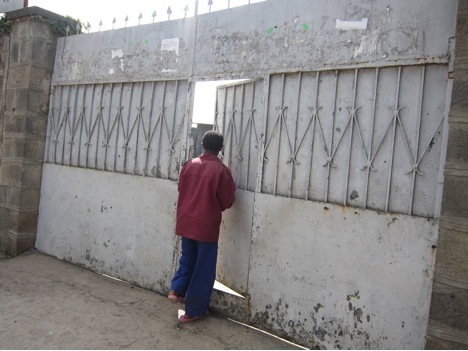 Behind this gate is the Fregenet Kidan Lehitsanat, an elementary school that serves more than 200 of the most needy children in a city full of desperately poor people. Walking through the gate a couple of weeks ago, I wasn’t sure what to expect: shy, somber expressions? thin, watchful faces? bashful, hunched postures? Visiting the Fregenet School was the most positive, up-lifting ìYes, we can!î experience I’ve had since November 2008 (or perhaps ever). This is a place where children sing, read, laugh, write, count, play, eat, and grow. Begun in 2004 with a class of 31 four-year-olds, the school now goes through fourth grade. Class size is limited to 30 children and books, notebooks, uniforms, breakfast, lunch, and health care are provided to every child for free. In just six years, the Fregenet School has become an important part of its community beyond the front gate. The library is open to neighbors. Last year’s graduates, now fifth graders, return to the school for lunch every day and continue to receive help with fees at their new school. More good news: the Fregenet School does all of this with an annual budget of about $30,000 (plus in-kind contributions of food and supplies from Feed the Children Ethiopia). But these are not ordinary times and there is more bad news: The owner of the land and buildings that make up the Fregenet School has decided to sell the property in the new year. The asking price is 3 million birr, or roughly $180,000. While the Foundation has commitments for $30,000 of this, there are no financing options in Ethiopia, no payment plans or promissory notes. You and I have a chance to give this story not a happy ending, but a next chapter. If we can raise $150,000 by the end of the school year, the Fregenet School will continue to educate, feed, and support the most needy children and families, and will deepen its work in the community. If we cannot raise the money, the land and buildings will go to another buyer and the school will lose its home. For me and my family, making a gift to the capital campaign of the Fregenet School is a way to ensure that hundreds of children will have the chance to learn and grow and give back to their community. Without our help, they might not. I hope you will join us in sending a check, making an on-line donation, or arranging a gift of appreciated securities. All contributions to the Fregenet Foundation are tax-deductible. You can indicate ìFregenet School Capital Campaignî in the memo field of your check or PayPal window. Click here to go to the Fregenet Foundation’s secure website. Click here for more information about the Fregenet Kidan Lehitsanat School.